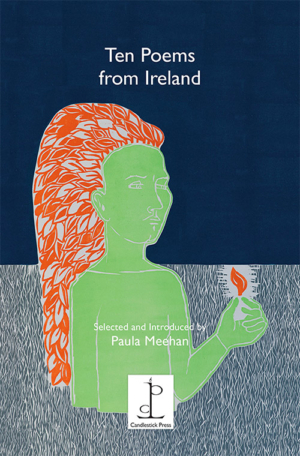 Ten poems chosen by Paula Meehan, one of Ireland’s major living poets… Our latest publication is a spellbinding selection of modern poems that encompass Ireland’s folklore and recent history, alongside enduring themes of ageing, love and childhood. There are poems about ‘The Troubles’ and about what it means to be Irish, as well as poems about the country’s bi-lingual heritage. These are poems that speak plainly and with a directness that will appeal to every reader. We think we can guarantee that both seasoned readers and newcomers to Irish poetry will find plenty to relish in this selection. “She was a song that nobody sings. Paula Meehan has published seven award-winning collections of poetry, which have been translated into many languages. She was Ireland Professor of Poetry from 2013-2016 and lives in Dublin. Poems by Eavan Boland, Moya Cannon, Tony Curtis, Michael Hartnett, Brendan Kennelly, Gearóid MacLochlainn, Thomas McCarthy, Paula Meehan, Nuala Ní Dhomhnaill and Leanne O’Sullivan. Cover illustration by Alice Maher. The pamphlet is dedicated to the memory of John Montague. Ten poems about London - poems that capture the essence of London, listening in to its music, roaming its pavements.